SHOT show 2019. 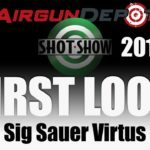 We’re at the SIG air booth giving you the first look at the Sig Virtus ASP. Now this is based on the other firearms, it’s got a lot of the same parts, and it the grips the same, the handrails, got the M block rail here with the Picatinny rail on top. It’s regulated. It’s regulated PCP, inputs you know we’ve got a 3000 psi tank, it’s regulated by 1100 psi, that hits into 500 shots per fill in 22-caliber. That’s really remarkable, you’re getting the same the 30 round magazine that we’ve seen on the MPX. MPX works really well really reliable, you can take out the same controls and and everything here. Price, it’s gonna be about $299, we’re expected to see that here in the next you know spring/summer. So for more SHOT show updates just stay tuned.